I straight up tricked my boys with these muffins! Zucchinis, bananas, bran flakes. BRAN FLAKES!! And they didn’t even know it. Gobbled them right up and kept asking for more. It might have been the chocolate chips sprinkled on top that lured them and masked all the healthy, nutritional stuff, but I’ll take it. These are a perfect breakfast before a long day at school. Which, I can’t believe I’ll have a kid in Kindergarten in a week and a half!! A part of me is really ready to have him back in school, Owen thrives with structure. But all day? Everyday? It’s going to be a rough transition for him. But with one in full day kindergarten and another in preschool three days a week, I’m enterting a new phase of life! Bring one cup of water to a boil. Remove and stir in 2 cup bran flakes. Set aside. In another bowl combine zucchini (ring out extra liquid), 2 mashed bananas, 1 egg, brown sugar, melted coconut oil, milk, flour, baking soda, baking powder and a pinch of salt. Mix well. Lastly stir in bran flakes. 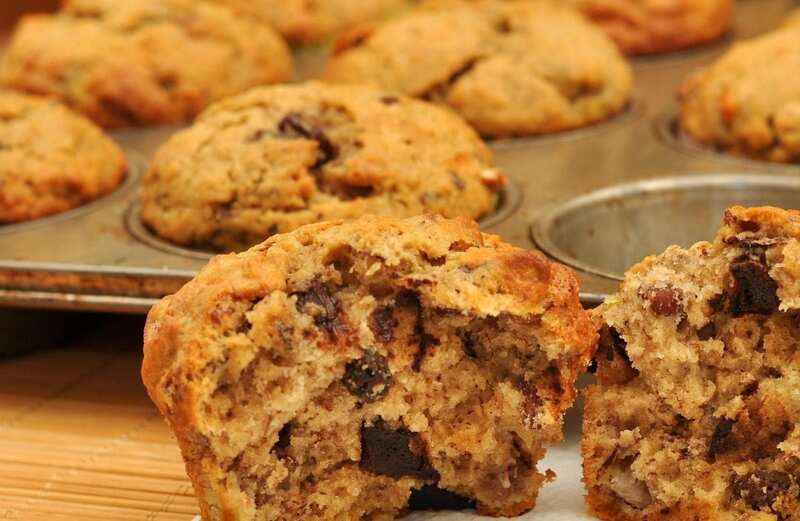 Pour batter into greased muffin tin (or lined with cupcake liners). Sprinkle a few chocolate chips on the top of each. Bake for 15-17 minutes or until a toothpick inserted comes out clean. You can always skip the chocolate chips on top if you want too…. Sorry, but how can I find measurements for the recipes on your website? I’ve come across a lot of posts that just have some ingredients mentioned but don’t give the recipe itself. Or am I missing something? I just moved to a new domain and there was a bug with the recipe cards! Should be there now Heidi!! Why would you leave out the chocolate?? Okay for the life of me–I don’t see the recipe?? It should be there now!! The cooking time is took much longer than 17 min… Should I be concerned? Also, they sunk in the middle? Barbara I think it can range depending on oven and altitude! Cook until pass toothpick test!